Here is a picture of one of the greatest men we know Muhammad Ali with former Haitian dictator Jean-Claude Duvalier. This picture was provided thanks to the son of Mr. Duvalier. Nicolas Duvalier. 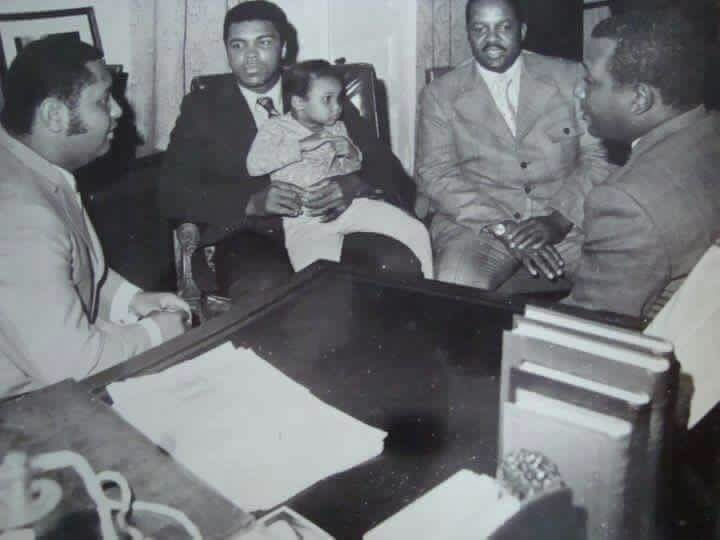 Nicolas Duvalier, the son of Jean-Claude Duvalier (Baby Doc), has shared a rare, never before seen, photo of the late heavyweight champion, Muhammad Ali, and his father Baby Doc. However, authenticity and context of the photo could not be verified. As per Nicolas Duvalier's twit, this photo was in his personal collection and the child with Ali is Ali's son. In a book of named "Paradise Lost: Haiti's Tumultuous Journey from Pearl of the Caribbean to Third World Hot Spot" by Philippe Girard, the writer had mentioned that, "By the late 1970's, seventy thousand U.S Tourists visited Haiti every year, including such African American celebrities as Cassius Clay (a.k.a. Muhammad Ali) and Arthur Ashe."... The photograph might have been taken during one of such visit. Here is a picture of a supporter of Jean Claude Duvalier during his funeral on Saturday, October 11, 2014. many of the supporters of the regime were really affected by the death of their leader.
. Some people from the elite class as well as former associates of Duvalier's regime arrived in luxury SUVs to pay respect to their leader. President Michel Martelly did not attend the funeral, however som high officials from his government did. We did see the presence of Former President Boniface Alexandre. Di anyone see Prosper Avril at the funeral? Mezanmi, gade coman yon sipote Divalye ap rele. Anpil moun te afekte par lanmo sa. 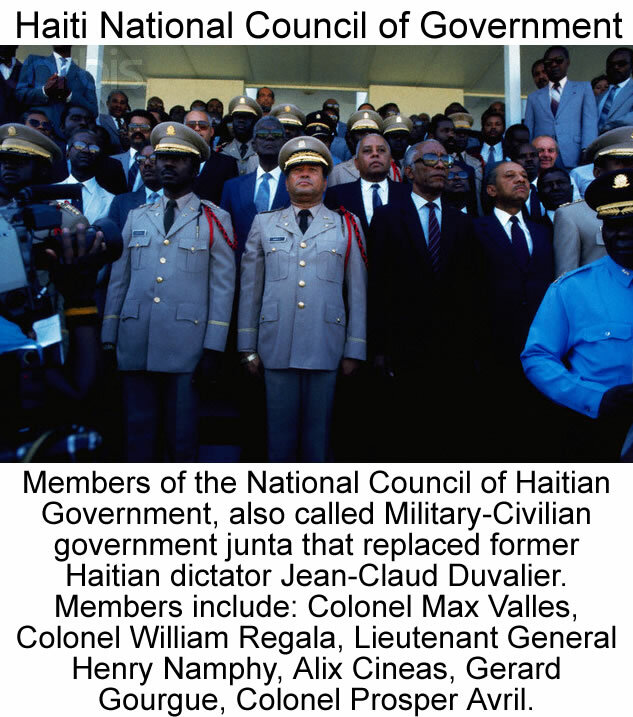 February 07, 1986 Port-au-Prince, Haiti: Here is a picture of the members of the National Council of Haitian Government, also called military-civilian government or junta that replaced former Haitian dictator Jean-Claud Duvalier. This picture was taken during the ceremony instituting the new team. Members include: Colonel Max Valles, Colonel William Regala, Lieutenant General Henry Namphy, Alix Cineas, Gerard Gourgue, Colonel Prosper Avril. The National Council of Government was the ruling body of Haiti from 1986 to 1988. Henri Namphy (born November 2, 1932 in Cap-Haïtien) was a political figure and Haitian general. He served as the President of Haiti's such interim ruling body, the National Council of Government, from February 7, 1986 to February 7, 1988. Again, Namphy served as the President of Haiti (from June 20, 1988 to September 17, 1988) until his deposition by a Haitian coup d'état. The National Council of Government was formed as a joint military and civilian provisional government following the exile of President for Life Jean-Claude Duvalier. The council consisted of a President, Lieutenant General Henri Namphy, and five Members, three from the military (Colonel Max Valles, Colonel Prosper Avril and Colonel William Regala) and two civilians (Maitre Gérard Gourgue and Mr. Alix Cinéas). Resignation of Gerard Gourgue on March 20, 1986, led to a commotion among this small group and a new National Council of Government was formed within a month with three members (Colonel William Regala, Mr. Jacques François from April 1987 and Me. Luc D. Hector from February 1988) and 13 ministers. This ruling body took two important measures: rehabilitation of the blue and red Haitian flag on February 17, 1986 and the dissolution of the Volunteers of National Security on February 15, 1986. Here is a picture of Corp des Leopard In Haiti, Haiti Military. During the rule of Jean-Claude Duvalier (Baby Doc) the Leopard Corps In Haiti was created in 1971 with United States' assistance as a "counter-insurgency" force to provide support with a relatively modern tool for responding to country's internal threats and to balance two powers between the Haitian Armed Forces and the Tonton Macoutes (became the Volontaires de la Securite Nationale or VSN after 1962 with around 9,000 members). However, the Leopards were described by human rights investigators as "particularly brutal in dealing with civilians" (its activities were often suppressed). Some of Haiti's subsequent paramilitary leaders got their start in the Leopard's camouflage outfit. James Byers, the CEO of Miami based Aerotrade who was in charge to train the leopards, had later admitted before camera in mid 1980's, that Aerotrade did this under CIA contract. 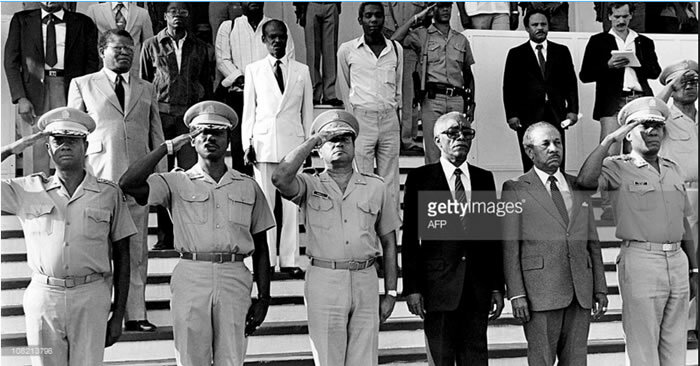 The force, consisting 700 members, was Duvalier's a personal security force where the participating members required a higher education level to join. 'Corps des Léopards' was disbanded within a month of an attempted coup in 1989. Here is a picture of Jean Claude Duvalier and Michele Bennett as they are leaving Haiti to go into exile. Although Jean-Claude Duvalier (Baby Doc), replaced a few older cabinet members with younger men, instituted budgetary and judicial reforms, released press censorship, released some political prisoners, he had ruled the country with a bloody brutality. He was a hedonist who always strives to maximize pleasure. 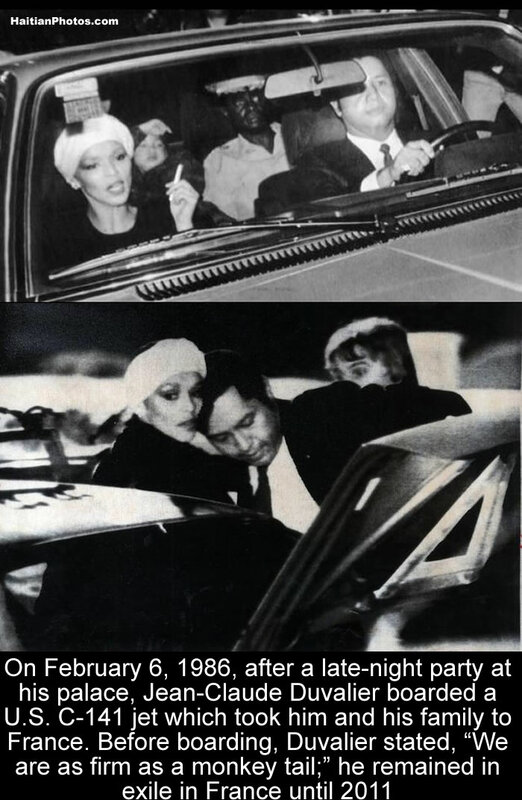 When political repression and a worsening economy set off violent unrest and a series of riots broke out across Haiti, fearing for life, Duvalier fled to France on a temporary asylum on 7 February 1986 in a U.S cargo plane accompanying his family and 17 associates. When France rejected his appeal for political asylum and asked him to find another place of refuge, he found no other country to accept him. 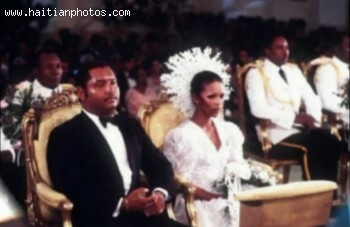 On 27 May 1980, Duvalier married Michèle Bennett Pasquet in a record extravagance manner. With his divorce from Michel in 1993, he lost most of his wealth and had to live a modest life in his remaining part of exile. However, he had supporters who founded the François Duvalier Foundation in 2006 and they used to promote the positive aspects of the Duvalier presidency while he was in exile. On 16 January 2011, during the presidential election campaign, Baby Doc came back to Haiti after 25 years of exile. He announced that, his return is not to join politics, but to help to reconstruct the country. He died in his home of a heart attack on October 4, 2014. Here is a picture of Dr. Rony Gilot who became Secretaire Adjoint of the national palace. Dr. Rony Gilot, a veteran politician and author, has been chosen as the Secretaire Adjoint of the National Palace. 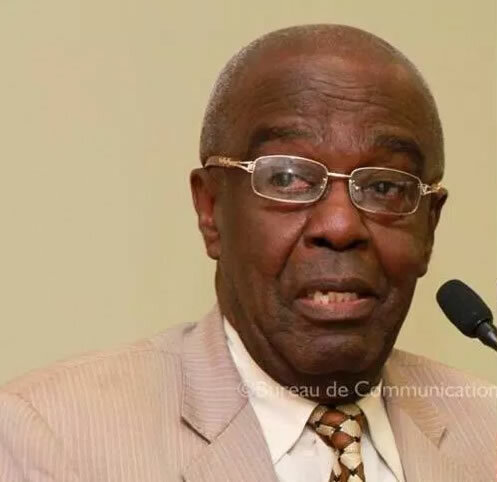 Dr. Gilot was once the Information Minister of Baby Doc Duvalier and used to maintain regular communication with Baby Doc when the junior Duvalier was in exile in Paris. He has written a biography of the Papa Doc Duvalier titled "The Misunderstood". Gilot is sympathetic and partially supports the autocratic rules of the Duvalier era, because he believes that it was in some ways, were similar to the postwar German and Italian rules, necessary to make a nation disciplined. His latest book released in 2012 was titled as "In Grateful Memory of Jean-Claude Duvalier or Luck Overused". He has also written a book on the former Haitian Prime Minister Garry Conille titled as "At the Option of the Memory ̶ Garry Conille or the Passage of a Meteor." A citizens' activist group is against deceased former dictator Jean-Claude Duvalier being honored with a state funeral. They have begun a petition to stop Martelly from following protocol that necessitates a former president be given national honors. The petitioners find holding a state funeral for Jean-Claude the white washing of ". . . the legacy of Duvalier's regime, and . . . of his father .  . . Francois . . . Duvalier before him . . ."
Here is a photo of The Marriage Of Michele Bennett And Jean Claude Duvalier. Michele Bennett was first married to Alix Pasquet the well-known mulatto officer. With him, she had two beautiful children Alix Jr. and Sacha.